The Claws of Ahamkara are a subclass neutral exotic that has quite a benefit in delivering those last few points of damage or to unleash a flurry of hell with your palms. The exotic perk, The Whispers, provides your Warlock with an additional melee charge for all Warlock melee abilities. This is incredibly useful as a damage output mechanism to help you win those melee battles or even to finish off an enemy if you run out of bullets and do not want to waste time reloading. On top of this The Whispers allows you to place melee hits faster than if you were not wearing them and the ability to get the first hit in is always beneficial in both PVP and PVE. The Claws of Ahamkara have a simple but badass design that just showcase power and strength. The gauntlets are covered in what appears to be the feathers of a large bird and the three taloned claw resting on the shoulder attests to that fact. But the objects covering this exotic are the bones of a beast known as the Ahamkara. The bones appear to have striations on them, possibly from wear or even joint connection and are similar in shape to Cuttlefish bones. The pattern of the bone arrangement, places the smaller bones closer to the wrists and the larger ones underneath and further up the forearm. This creates a plated armour effect that provides maximum strength. 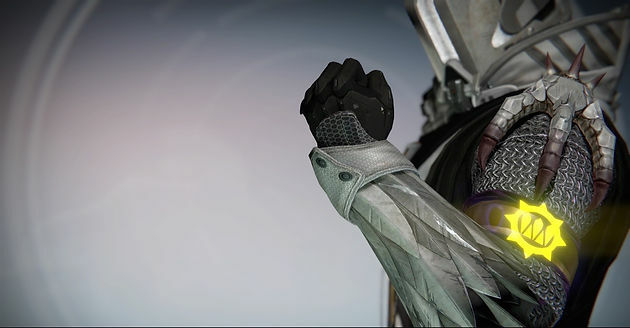 The Claws of Ahamkara can be gained from an exotic gauntlet engram or purchasing it from Xur if you are lucky enough for him to have it in his inventory.